On a recent Sunday afternoon, Dilla's Delights could've been banking. The Detroit Tigers home game at Comerica Park across the street from the downtown store led as many curious baseball fans to wander into the shop as hip-hop fans. But the baseball bros weren't carrying vinyl, and they were turned away doughnut-less. That was a show of dedication from Dilla's co-owner Mike Vanover and J Dilla's daughters, Ja'Mya and Ty-Monae'. 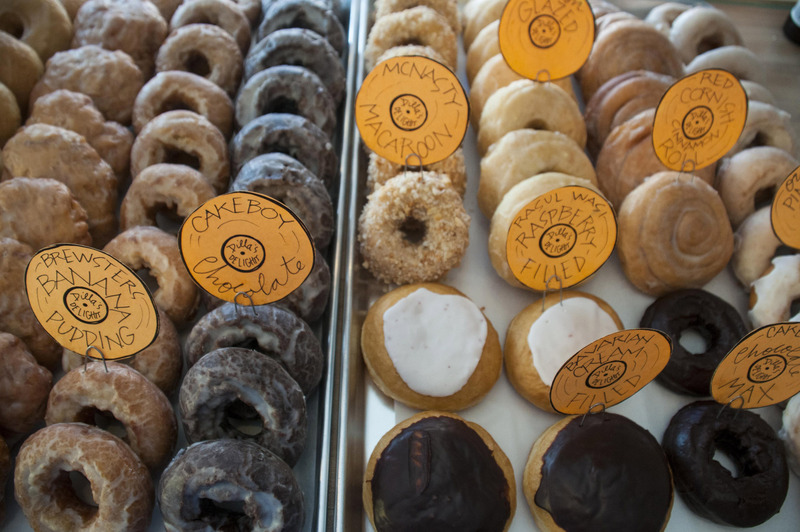 For one day only, Dilla's was offering a record-for-doughnut swap—no cash. So even though some left bummed and the cash register was empty, Dilla's bulked up its in-store record collection and ensured doughnuts remained for its fans. Inside Dilla's Delights. All photos by the author. While money is, of course, important, Ja'Mya, 14, and Ty-Monae', 16, (the "Delights") tell MUNCHIES there's a bigger goal: "To carry on the legacy" of J Dilla, the Detroit hip-hop artist/producer who passed away in 2006. He died of complications from lupus and a rare blood disease just three days after his 32nd birthday and the release of his influential album, Donuts. The doughnuts and Dilla's Delights are the work of J Dilla's uncle, Herman Hayes, a.k.a. Uncle Herm. He and his nephew were tight, sharing the same taste in desserts as J Dilla grew up. Uncle Herm used to work at a Michigan doughnut/diner chain called Dawn Donuts and would hook up Dilla, who liked the doughnuts more than anyone in the house. That's where he developed his sweet tooth, and later in life he began encouraging his uncle to open a doughnut shop. The shop held a one-day "records for doughnuts" promotion this week. In 2006, Herm knew Dilla was sick and his mother was caring for him in Los Angeles, but the news of Dilla's death blindsided him. At the same time, he learned the new album was called Donuts. "As he was passing away, he was making an album called Donuts—when something like that happens, you reflect back on it and you're like, 'I know what I'm going to do for the rest of my life,'" Herm tells MUNCHIES. "I felt honored that I was the kind of the drug pusher, the dope man, so to speak," he adds with a laugh. "We're asking a lot of customers, but you can taste the difference," co-owner Mike Vanover says of the doughnut prices. Recent offerings included Cakeboy Chocolate and McNasty Macaroon. While Herm knew Dilla's music, it wasn't a world that he ran in. But he started exploring his nephew's catalog and quickly turned into a true admirer of Dilla's work and of hip-hop. "I ended up becoming a huge Dilla fan, and not just because he's my nephew. It was just like, 'Who is this guy?' So I'm finding out who Dilla was, because I was still calling him 'James' at the time," Herm says. "He was my nephew and I changed his diapers, so it's like learning about a whole nother person." Several years later, Herm and Vanover met at an open mic night, quickly hit it off, and eventually partnered to carve out a 600-square-foot space that opened earlier this year in downtown Detroit's former Milner Hotel. The location is significant because it's where J Dilla once lived and helped out his mom with a diner she ran on the ground floor. Herm also wants Dilla's daughters involved. The business exists for them and their future, Herm says, and it may be one of the few benefits from their dad's legacy beyond his artistry. In the wake of Dilla's death, the family learned they couldn't use his likeness for commercial purposes, and there's little royalty money despite his influence. "People are playing tug of war with his music and royalties, so this is [the Delights'] baby that we want to grow and turn into three or four more stores around the country. We have to have a life for them, get them the things they wouldn't need if he was still alive," Herm says, adding that the he and the girls also work to raise money for lupus research. Ja'Mya and Ty-Monae', who agree on their favorite doughnuts (Red Cornish cinnamon roll) and favorite Dilla record (all of them), say they appreciate that their father's memory is carried on at the store, and that they're getting a chance to sling doughnuts: "I like the idea because we get to work, everybody comes here, and it's a nice environment," Ty-Monae' tells MUNCHIES. J Dilla's daughters, Ja'Mya and Ty-Monae'. The small, clean shop is bare bones with no more than a counter holding doughnuts and coffee, and a narrow ledge with a few stools. A small amount of memorabilia, photos of Detroit, and baseball photos hang on the wall. There's no kitchen as the doughnuts are prepared at Detroit's Avalon Bakery, a well-loved coffee/pastry/bread shop where Uncle Herm cut his teeth. There he learned to appreciate the finer ingredients that go into Dilla's doughnuts like all-organic flour, eggs, and milk. The doughnuts are also fried in rice bran oil instead of the usual canola, and Herm's recipe book is full of varieties that aren't standard cheap doughnut fare. And the names of most reference J Dilla—on Sunday, those with vinyl chose from, among others, Conant Gardens Glaze, Brewster Banana Pudding (after the Brewster-Douglass housing projects), McNasty Macaroon, Cakeboy Chocolate Max, and several vegan options. Savory doughnuts like broccoli and cheddar, or rosemary, potato, and garlic topped with a goat cheese spread will soon join the menu. Vanover says there's sometimes sticker shock over the $2 doughnuts. Not exactly a steep price, but as he explains, "Detroit is 50-cent doughnut town. We're asking a lot of customers, but you can taste the difference. It's better than what you get from the competition. You don't feel like crap after you eat one. You don't regret it."